Down the hill from the yurt is a stream. For a long time it has been almost completely dry, the stream bed had become a path. Just a few puddles in the deepest places remain. It is a beautiful wonderful place to walk. A path through wonderland or fairy land. In places the path is wide shallow and stony, in others, it is deep and narrow. Ferns grow at head height. The remaing puddles are deep bowls carved into the earth at the base of waterfalls. The curves and twists of the path reflect the spiralling, flowing force of water. Deep undercut banks shelter the homes of water loving animals and exposed roots like tangles of hair reach wild across the ground. It is a place of magic and wonder and it is my office, my school, my mother and confidant. It is plain to see where the water rises to in full flow. I wonder what would it take, how much water and how much rain we would have to live through to raise the water to attain those old heights. It never ceases to blow my mind. I have been there when the stream has been flowing in full force, fast and full of mud, rushing, deep. Alarming with small children. It was another world in another time, another possibility of being. So when at last, it started to rain, a whole day and a night, I rushed eagerly to the stream to watch the changes. How does a stream start to flow? The rain is running down the hills on both sides. The existing puddles start to get deeper. 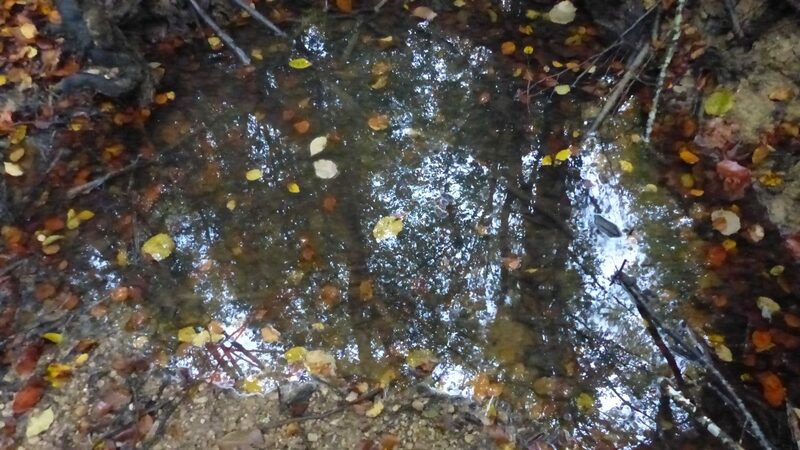 New puddles start to form, a series of puddles dotted along the stream bed. As the rain continues, the puddles deepen and spread out and at some point, they touch and join. And when they join, the flow starts, the stream officially starts to actually move water along its course. Simultaneously, is a plentitude of many, many other streams created at each and every crevice in the hills, that run into ‘my’ stream. Exponentially, the stream gets deeper, wider, stronger, until it is racing through the landscape, unstoppable, unimaginabe in its power, endless in it flow. Awe inspiring. In these times of so much challenge, when the endless repetitions in the media is the news of that which is breaking down, that which is being destroyed and damaged, when our hearts are so heavy with the weight of what we do to each other and our world, there are many, many puddles world wide. We are the unnoticed, insignificant puddles and the rain that is filling us is the tears of our pain that we cannot go on like this any longer. And we are rising, we are deepening, we are spreading and we are connecting, and as we do so, our stream begins, our power begins to flow. The unstoppable, endless, immense power of flowing, is the guidance that nature provides for us, within us. We can hear it just by just saying YES and listening to our hearts. This is a wonderful, powerful, incredible time as the puddles rise. Even in the dry, dry stream bed, some puddles have remained. On my walks, they have been the places that I go to, the oasis, the magical holding of promise, of love, of abundance. In our hearts, we are all part of this stream, we are all included in this magnificent flow. The stream does not chose good or bad, but rises, and carries and includes all. It is inevitable. All is well. All is imbude and saturated with this uncontrollable power that is love, that is life. No one is left behind. Say yes to the rising tide with in you. The yearning to follow your heart, the longing to listen to the wisdom you contain within. You do not have to be reconnected to it. You are it. Just listen and say yes. As you ask to be guided, in your hunility and surrender, the loving embrace will show you the way.